On its 20th anniversary of becoming a publicly traded company, Amazon is now worth twice as much as Walmart. It's hard to believe a company that started as a modest bookselling operation would upend the traditional retail landscape, drastically changing the way we shop and consume entertainment. So, how did Jeff Bezos' online bookselling operation — which was briefly known as "Cadabra" — become the Amazon we know today? Amazon's mark cap, that's the total value of outstanding shares, is $465 billion. By comparison, Walmart is worth $229 billion. And Bezos himself is currently worth over $80 billion. It took Amazon 18 years as a publicly traded company to catch up to Walmart, but just two more to become twice as big as the ultimate brick and mortar superstore. Amazon's mark cap, that's the total value of outstanding shares, is $465 billion. By comparison, Walmart is worth $229 billion. What If You Had Invested in Amazon's IPO? If you could go back in time and invest $10,000 in Amazon's IPO, you would have around $5 million by now, according to the Wall Street Journal. Amazon made its first sale in July 1995. The product? A book called "Fluid Concepts & Creative Analogies: Computer Models of the Fundamental Mechanisms of Thought." 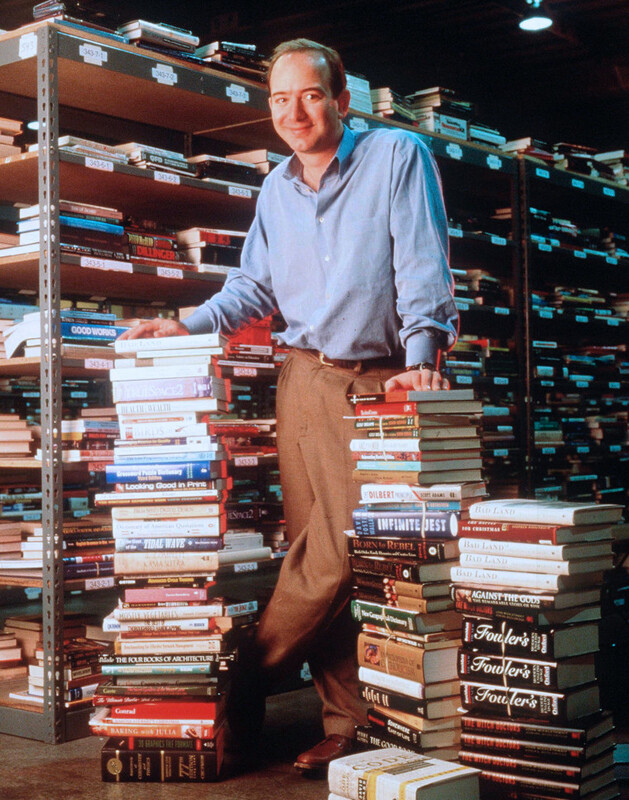 Remember, online shopping wasn't even a thing at the time, so it's apropos that the company's first sale was a geeky book to someone who likely had enough computer savvy and guts to trust this newfangled idea of buying something over the internet. Amazon drastically expanded in 2003, adding new categories, including sporting goods, outdoor equipment, gourmet food, and health and personal care products. The company also launched its first international sites, in the UK and Germany, in October 1998, marking the start of its global expansion. Months after its IPO in 1997, Amazon introduced one-click shopping, allowing customers to speed through the online shopping process. When we want to order something from Amazon today, it's as easy as telling your Amazon Echo or pressing one of Amazon's physical "on demand" Dash buttons in your house. Amazon also pioneered the idea of free shipping. In 2002, the company lowered its free shipping benchmark from $100 to $25. Members of Amazon Prime can also enjoy free expedited shipping and, in many markets, pay a small fee to get two-hour delivery of some Amazon Prime Now products. In December 2016, Amazon showed us what the future of deliveries will look like when the company made its first drone delivery in England. For now, the company still has a way to go with U.S. regulators before seeing that dream become a reality, however CEO Jeff Bezos is resolute that one day delivery drones will be as ubiquitous as mail trucks.